Includes Lockout Feature - Padlock not included. 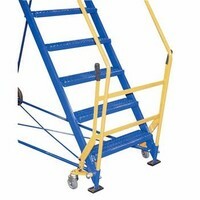 Push handle forward to gain access to ladder. 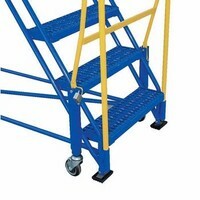 Casters are raised from floor and becomes stationary. Pull handle backwards to prohibit access. Casters are lowered and unit becomes portable. Finally an easy and safe solution for reaching products on high shelves. 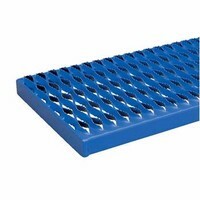 Constructed of square tubing framework, which handles uniform capacities up to 350 lbs. Units feature a 58° climb angle and EZ models feature a 50° climb angle. The handrail height is 30". Each step is 24"wide by 7" deep. 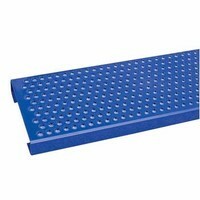 Choose either grip strut style or perforated style steps. Front wheels are10" diameter. 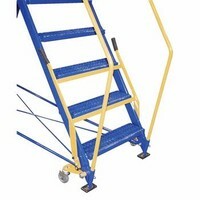 Unique design allows ladder to separate for shipping and storage. Welded steel construction with powder coat finish. 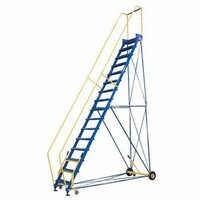 Manufactured in compliance with OSHA 1910.29 and ANSI A14.7 standards. Units are shipped knockdown, some assembly required.